This is another one of my favourite recipes. I have had this for a long long time. It was only when I joined a mummies forum that I started sharing this recipe online. Many people have tried and most of the time I get good feedback. For those of you who just love a creamy, soft and yummy mango pudding (just like those served at tim sum restaurant, if not even better), you must give this recipe a go. 1. Mix water, sugar and gelatine in pan. Boil over slow fire until sugar and gelatine dissolve. 2. Leave the mixture to cool. When cool, add mango puree, mango cubes, whip cream and ice-cream. 3. Stir mixture until all ice-cream is melted. Pour into small cups and leave in fridge to set. wah so late still blog..pai seh,i also ilke tat...nite owl..
And hope the molars extraction will not be too painful for you today!! So glad that your food blog is finally up. Will bookmark this link. My family loves your mango pudding. Thank you my friends. I am still groping my way around. Still very new to blogging. Stoneage woman lah. Thanks for creating this blog. Happy baking and cooking. How do you measure the 250gm ice cream? Scoop it up and weigh it? If replace with vanilla flavour, how much to use? Love mango pudding serve with evaporated milk, must try your recipe. Yes, measure 250 gm of the ice cream. Whether it is mango flavour or vanila flavour, the amount is still the same. Yes, you can use all 100 ml of whipping cream or you can use 30 ml of UHT milk and 70ml of whipping cream. I am based in KL and I have tasted very nice mango puddings when I was in Singapore. I would like to try out your recipe but I may I ask if the mango puree is made from freash mango or bought frozen from supermarkets. Secondly, what are mango cubes and where can I find them? Please advise - is the whipping cream to be whipped 1st b4 adding or just pour straight out from the box? Thks! Pour straight from the box, no need whipping. Hi, thanks for the wonderful receipe. However, my pudding turned out to be soft and creamy (like ice-cream). Can you please tell me what is wrong? Did you make sure that all the gelatine is dissolved? All ingredients measured correctly? Anyway, this pudding's texture should be mousse-like. So it shouldn't be hard in the first place. I just finished making this pudding but unfortunately, it curdled instead of being creamy and smooth. Do you know why? Otherwise it tasted yummy. Did you wait until the water, sugar gelatine mixture was too cold? Don't let it be too cold, it is better to add your ice cream, mango puree when mixture is warm instead of cold. This way, the ice cream will melt better when you are stirring it. Do not be tempted to use the sugar water when it is still very hot, your pudding will come out with two layers when cold, a lighter colour and darker colour layer. I did cool it down. I put in the mango puree and cubes 1st. When I added the icecream it started to curdle immediately. Is the ice cream supposed to be hard or melted when I add into the gelatin-sugar mixture? For the whipping cream, does it matter if it's dairy or non-dairy? The ice cream can be a little melted. Do this when the gelatine mixture is a little bit warm (not hot). Reena, it doesn't matter, both are ok to be used. Mine tasted more like mousse than pudding leh... Do you have any idea what might have gone wrong?? Used PH's Topping Cream. Reena, you cannot add the ice cream and the rest in when the gelatine mixture is still very hot. Just warm. Tried yr mango pudding recipe but mine turn out very hard (more like kueh than pudding ! )And also, the ice- cream foam floats on top of the pudding, unable to dissolve/ remove. :( Wonder what happens...? this recipe looks yummy and easy to make! will be testing it out this weekend. 1) mango puree - how puree is it? do we just put the mango in a food processor? 2) the mango pudding is sometimes served up with a milky like sauce. would you have any idea how to make that sauce as well? Tried your mango pudding, Mine came out with a darker layer on the top lighter at teh bottom. I cooled the gelatine mixture already. whipping cream need to be rm tmp ot it does not mattter ? hi, can i use 100ml full cream milk instead of whipping cream? if yes, do i have to make any modification? Yes, you can replace with full cream milk. No need to make any adjustments. Hi anonymous, I doubt you can use cornstarch. I guess there is no other alternatives. Can you get instant jelly powder? Is this your self-creation recipe? hi may i know where did you get your gelatine powder? Hi anonymous, I bought my gelatine powder from Phoon Huat. At first I was rather discouraged when reading some of the posts here, what with curdling of the mixture and what not. But thank goodness everything went alrite, phew! Btw, i'm wondering if it's possible to substitute gelatin with agar-agar powder? If yes, how much do I use in place of gelatin? hi, may i know how to make the mango puree without a blender? would love to try your recipe. looks yummy :) thanks. You can try using very very ripe mango and let it go through a sieve to get mango puree if you don't have a blender. ur mango pudding looks so yummy, i getting ready all the ingredients already going to try out tonight! dun mind if i post ur recipe on my blogs if successful? Hi Peng, of course you can post my recipe on your blog as long as you give the relevant credit. Wish you success in your attempt. Hi Hugbear, my mango pudding is a success! thanks so much for sharing such yummy recipe! Can i replace gelatine with agar agar power? Can I know what is the replacement for gelatine. I could not find this ingredient. Hi Sara, you can use a little bit more than a cup of ice cream. Try dissolving another 10g of gelatine with 3 tbsp of hot water and pour this into the pudding. Leave the pudding in the fridge to set. is gelatine same as agar agar powder? Hi HuiShi, no they are not the same. can i just omit the vanilla ice cream? can i replace with other things? Hey, looks like a great recipe. I'm going to try to make it for my gal tomorrow night. Question, how do i get the gelatine? like where can i buy it from or how can i make it? i'm a lil unclear. You can buy it from supermarkets or from shops selling baking stuff. Can I replace the 30 ml of milk with evaporated milk? Hi Janice, yes you can. Hi, Bakingmum. I have tried your Mango Pudding is very nice. Instead of using mango can replace it with fresh orange juice. Just only the juice without cubes. If yes, how much should i use? all very nice, jus wan to say thanks you . Hi hugbear! I just came across your recipe and i thought it quite easy. I am a 13 yr old and i really wanna make this pudding 4 my mum to surprise her! Do u think i can do it on my own???? Yes, I should think you would be able to do this on your own. The only part where you need to use the store and fire is when you need to dissolve the gelatine with the water and sugar. You can do this over small fire just to be safe. 1)how long will it take for the pudding to set if i follow this recipe? 2)is it okay if i do not use the ice cream? Hi Reen, it will set in 1 to 2 hours' time. If you don't use ice cream it won't taste as good. I would suggest you try out the recipe w/o ice cream before your exam and also try to time how long it takes for your pudding to set. Reen, if the fridge is very cold, 1.5 hrs should be ok to set but the pudding will taste better if it is really cold. I think you should really do a test run before the exam. You may have to adjust the amount of gelatine a bit more if you are not using ice cream. I tried your recipe but I failed miserably. The pudding ended up like a pool of ice cream instead. I have put it in the freezer and will eat it like ice-cream. I used jelly crystals instead of gelatin powder (I thought they are the same and now am not so sure). Before I came to your blog to check if I had copied the recipe wrongly, I thought it could be that I had put in too much ice-cream. Well, I had used about twice as much mango puree and doubled the jelly crystals to 40gm. Could this be the problem? Other than increasing the jelly crystals and mango puree portions, I followed everything to the T and was mindful of the comments posted by others who failed. Can you also explain why the ice cream should only be mixed into the gelatin mixture when it is warm and not hot nor cooled? Hi Ida, you cannot use jelly crystals, you got to use gelatine. They are different. The reason for adding the ice cream when it is warm is for the reason of easy mixing it into the mixture. If you prefer to add it in when the mixture is cool, no problem also. Hi. tried your mango pudding. It's great. Now, if I want to make Durian Pudding, can I still follow this recipe? Made the mango pudding just the way you wrote... results... my hubby has been eating one everyday!! But somehow my pudding is more white in colour unlike yours... and very creamy. Wonder if it is caused by the vanilla ice cream i used? I just want to confirm more gelatin is to harden the pudding more? So i put lesser if I want it to be softer? 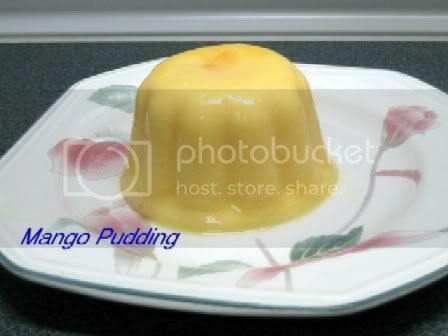 Can i request for other type of easy making pudding beside mango pudding? It is my first time trying doing puddings. The mango pudding curdled very quickly after i added in icecream and stirred until all melted. It started to curdle straightaway after i stop stirring. The gelatin mixture was little bit warmish when i added the freezer-cold icecream. Is that the reason what went wrong? My colour also looks very vanilla, not yellow and nice like yours. The taste is also weird, doesn't taste like mango nor vanilla icecream nor milk. Is 100g of pureed mango too little? I replaced the whipping cream with 30ml UHT packet milk. I have taken a photo of the pudding following your recipe and the pudding made using off-the-shelf mix. If you would be willing to email me at waimay35@hotmail.com, i will be able to share with you the photo and the texture of both. Pls do so. thanks for the delicious recipe :) Just tried it tonight and it worked quite well but because I'm from the UK, our mangos are not the best lol! the combination between mango and puding. wow..
thanks for share your recipe.